The Shuttle Radar Topography Mission (SRTM) was flown from the Space Shuttle Endeavour in February 2000 and used Interferometric Synthetic Aperture Radar to obtain a high resolution digital elevation database for much of the Earth. The resolution of the raw data was one arc second (30m). Initially 30m data was only available for the USA, elsewhere the resolution was 90m; recently 30m data has been released for the rest of the world. The data are freely available from NASA. In 2009 another dataset called ASTER GDEM was released and although covering 99% of the Earth’s surface the true resolution of the data is lower than SRTM. 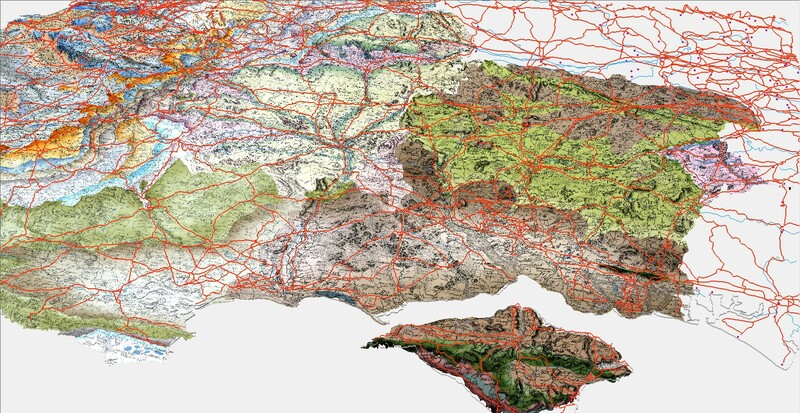 In the display above SRTM data have been converted into a 90m grid of cells each containing an elevation value in metres and assigned a colour. In the display shown below geological information from Smith’s County Geological maps and Cary County maps enhanced by Smith 1815 geology have been draped upon the SRTM elevation model in order to give a three dimensional aspect. 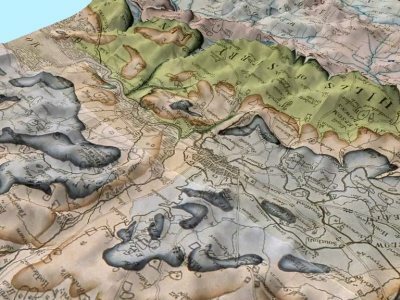 William Smith’s maps shown in 3D demonstrate, yet again, his complete understanding of stratigraphic concepts and his remarkable ability to convey that understanding in his maps. His technique of graduated tinting of outcrops already gave an impression of relief even in two dimensions. In 3D the effect is even more impressive. 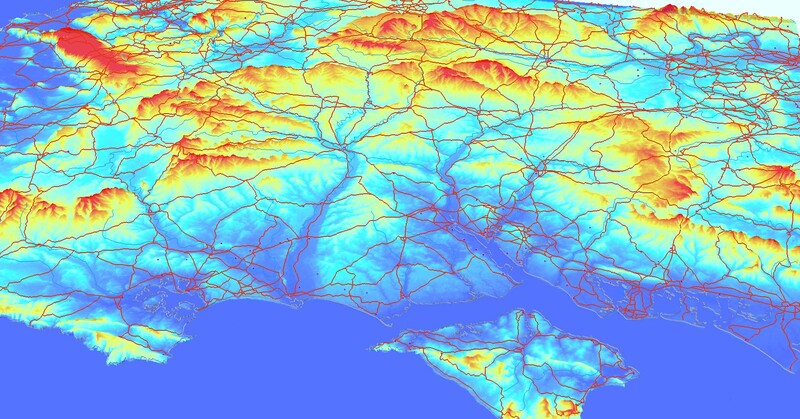 In the example (A) below, a modern seismic line is shown in cross-section across the Weald basin (North Downs to the left, South Downs to the right). 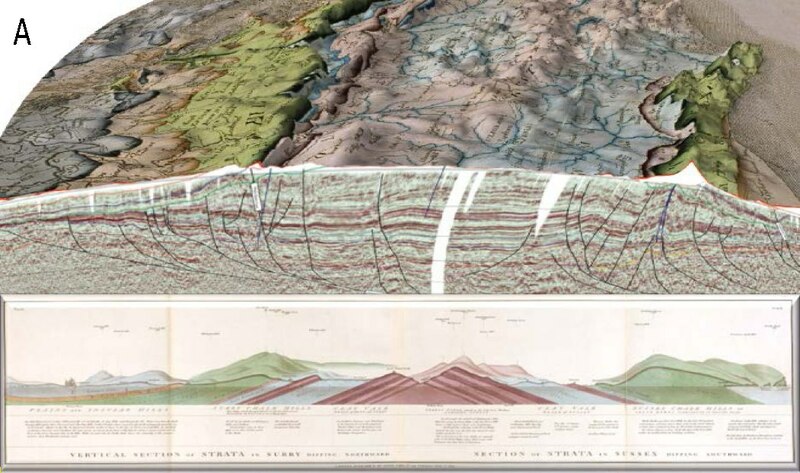 William Smith’s original Surrey-Sussex geological section is shown below the seismic section and at the same horizontal scale. On his section, Smith clearly shows strata dipping to the north in the Surrey part and southward in the Sussex part. 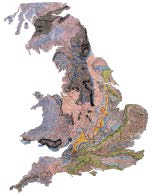 He makes no comment as to the mechanism which caused this and, of course, was unaware of the inversion of the Weald basin and the complex Variscan tectonic seen at depth; yet for all this, the upper part of his section is a good match with the modern seismic section. 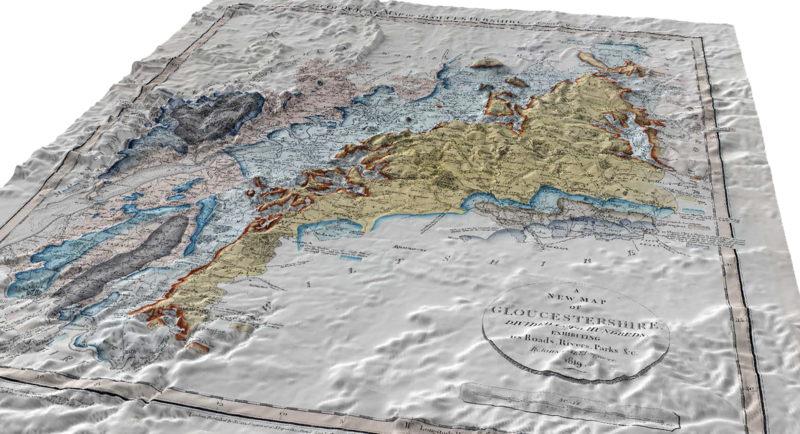 A short 3D movie of part of the 1815 map (B) made around London is also shown.